Traveling across time zones? New work schedule? Research suggests you can "trick" your body to get acclimated faster. Does flying across time zones or working the night shift have you mixing up your days and nights? A new study suggests there may be an easy fix: a food fast. By taking a long break from eating, you may be able to "trick" your body into acclimating to the new schedule—immediately—explains Clifford Saper, M.D., Ph.D., study researcher and a neurologist at the Beth Israel Deaconess Medical Center in Boston. Our bodies rely on external cues—sunlight, darkness—to regulate internal patterns (called circadian rhythms) that tell us when to feel tired or when to wake up. This sort of "clock" can only change in small increments each day, which presents a problem for shift workers and frequent travelers. As a result, it can take days for your brain to get the message that your "hours of operation" have changed significantly. For travelers, it's about a day for every time zone crossed. Since the 1920s, scientists have known that mice have a secondary "clock" that responds not to light, but to food: when food is available, they are alert and awake. Switching from "light-dependent clock" to "food clock" occurs when mice are re-introduced to food after a long period of deprivation. Eating causes a cascade of signals in the brain that activates the switch. And the transition happens immediately. In this latest study, published in Science, Saper and his colleagues were able to pinpoint the "food clock" location in the mouse brain (an area called the dorsomedial hypothalamic nucleus). 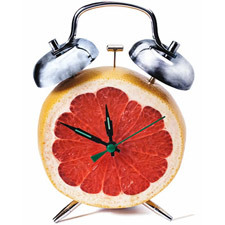 And as it turns out, people have brain circuitry similar to mice's, so even though scientists have yet to find evidence of a food clock in humans, Saper says, it's possible that playing with our eating schedules could help us adjust to new time zones and shift work. He, for one, plans to give it a shot on his next trip. "I think it's worth trying and it's not that hard to do," says Saper. Reset your clock. Don't eat for about 16 hours. If you're traveling, it's easiest to fast on your trip (you might need to start before you leave) and eat when you get to your new destination to help set your clock to the new time zone. If you're transitioning from one work shift to another, adjust your eating schedule so that you can break your 16-hour fast before you start your next shift.